Gorgeous Man is back in the country. He arrived very late Monday night. 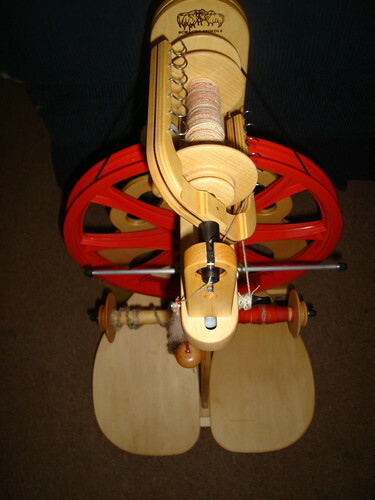 This week has been about getting life back in order and playing with my new spinning wheel. 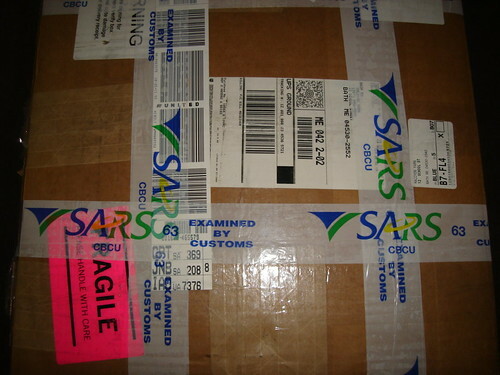 It came in a big box, that was opened for inspection at the airport by SARS. That would be the South African Revenue Service. There was an import duty charged, but it was minimal (much less than we were expecting having heard the horror stories…). Each Ladybug comes with her own ladybug stuck on somewhere. Mine is at the front where I can see her. Gorgeous Girl is most taken with this feature, and looks at the “Lady beetle” several times a day. 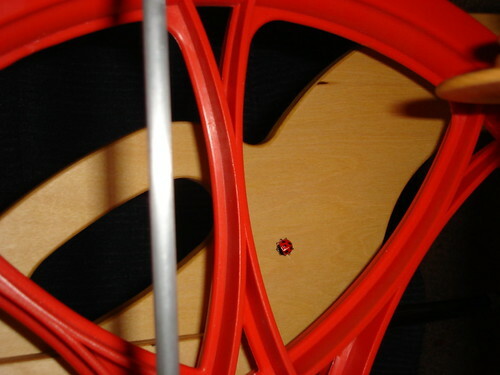 There has been completed yarn from the new wheel. Gorgeous Man also brought some stunning natural Blue Faced Leicester and some beautiful bamboo and merino, and merino and tussah silk top for me to to spin. 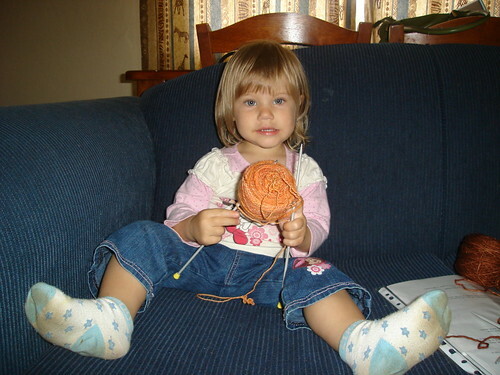 Gorgeous Girl asked to knit this week. 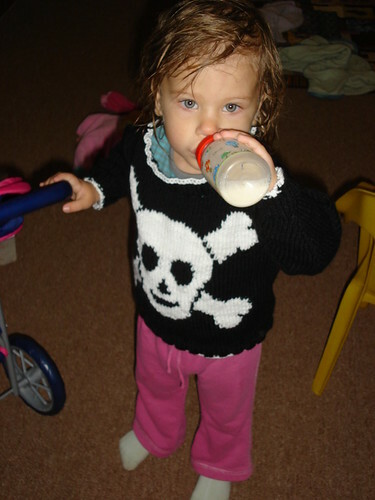 So here she is with her first knitting ‘lesson’. I’m hoping to have my charity cardigan finished this weekend (don’t have to work, and some travelling time in the car). I’ve also been doing the Socktober mystery sock KAL on Ravelry. That has been great fun. I need to get a move on with that too, I’m a bit behind. Hope things are well with all of you. I’m also slowly catching up on my blog reading. So, Gorgeous Man is currently in Portland, Maine. He left on Monday and will be back late Monday night. I’ve been telling Gorgeous Girl that Daddy will be home Tuesday since she will be asleep when he gets home. Thankfully a friend is picking him up from the airport so I don’t need to get Gorgeous Girl out of bed to sit in a carpark waiting. 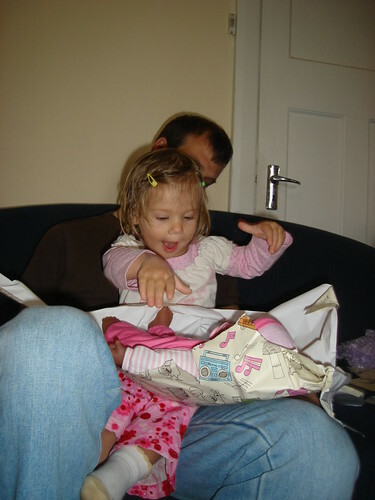 I’ve been surprised at how much Gorgeous Girl has understood where Daddy has gone. I think our trip to Australia has helped somewhat since she has been on a plane and knows what one is. She was most worried that they would give Daddy food and drink on the plane, which was very sweet. She has been telling people “Daddy gone. On a plane, to ‘merica”. I explained about different countries, and later that day she asked me what T’s (the girl who watches her while I’m working) country was. I was staggered that she had absorbed the abstract information. Life is hectic without Gorgeous Man here, and I always have chronic insomnia for the first few days that he is gone, so life has consisted of looking after Gorgeous Girl, working and collapsing exhausted on the couch at the end of the day. There has been a little knitting and a little spinning, but no progress worth sharing at this stage. Well, Gorgeous Girl is sleeping and I have the day off, so I’m going to try ad catch up on my very long list of blogs I haven’t visited for a while. Life has been hectic, and a certain little miss seems to need more and more entertaining lately. Still I’ve managed to get a bit finished here and there. First up, some spinning. 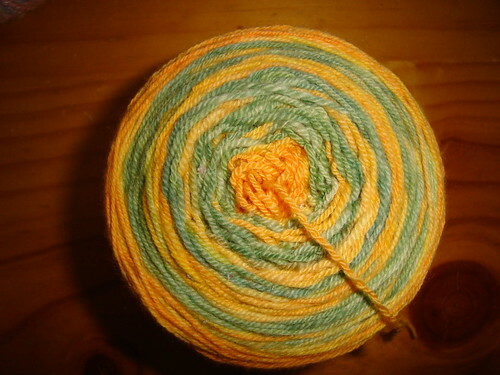 This is my attempt at sock yarn. 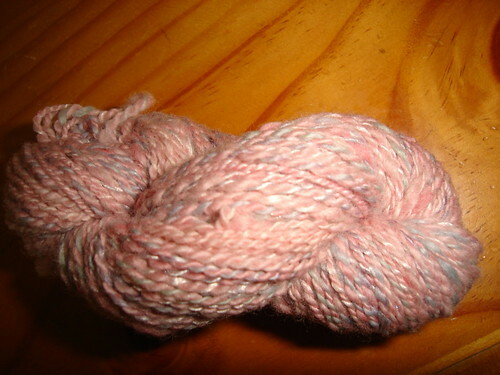 It is 3.35 ounces and 341 yards (95 grams and 312 metres) and is n-plied. I need to spin up the second half for the second sock. 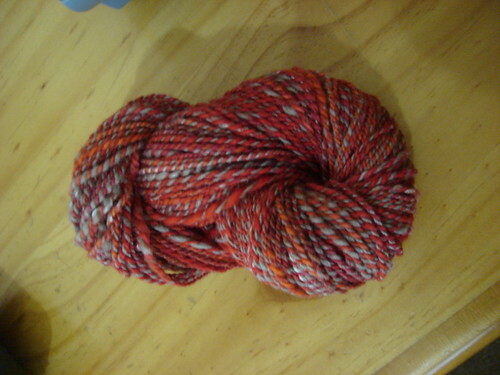 Recently I spun my first batt. Gorgeous Man is heading to Portland, Maine in just a few days time, and I wanted him to have something hand knit to keep him warm. The maroon is handspun and the grey is commercial yarn held double. If I was to do it again I’d leave off the bottom stripes and do them at the top. The pattern is Turn a Square by Jared Flood. 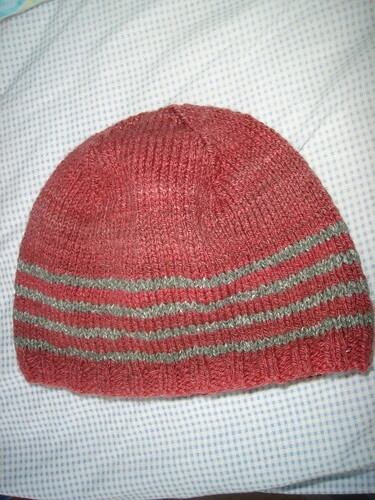 (Ravelry link). On Sunday I had a birthday that now puts me closer to 40 than thirty 🙂 I had a lovely day even though I worked. 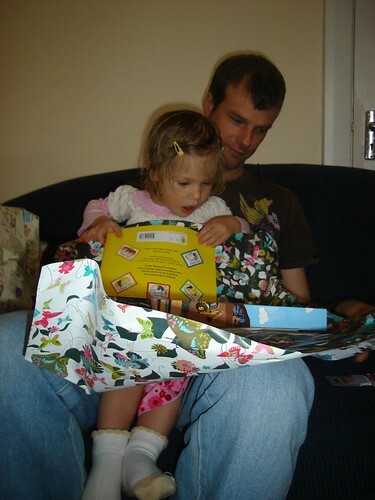 Gorgeous Girl’s birthday is exactly a week before mine, and so she now thinks that birthdays happen often. Unfortunately for her this is a September/October birthday house and she has a long time to wait for the next one. 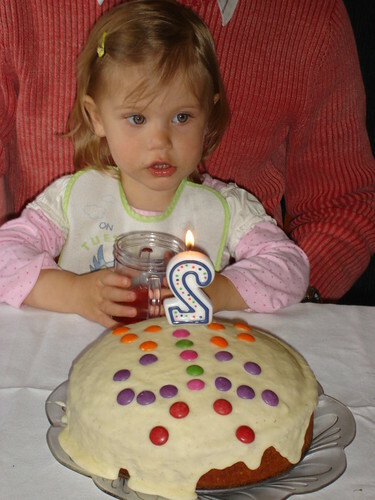 But I did make a cake for Gorgeous Girl’s second birthday yesterday. OK time to be truthful. 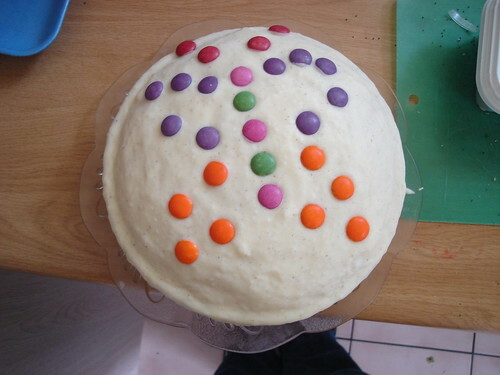 It tasted really good, and even better today, but Gorgeous Girl isn’t much of a cake eater and was happy to just have the Smarties off the top (she doesn’t get lollies very often). 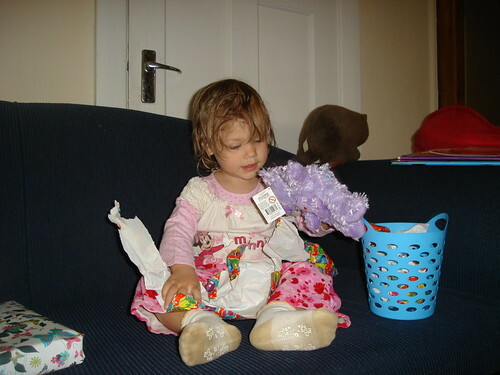 She was thrilled with her birthday presents though. I have to show you this picture, because it says volumes about her. We had to put the paper waste basket there for her to put the rubbish into straight away. She didn’t seem to mind the paper that came off in one big piece, but the little torn bits had to go straight into the bin. Gorgeous Girl is a child of diverse tastes. A new baby and a stroller. The stroller was a present from my Mum. 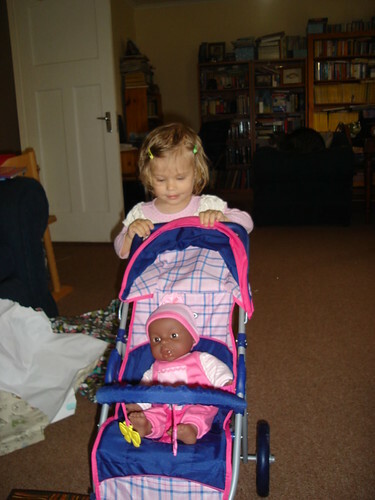 We will not discuss how freaking hard it was to find a black doll in South Africa! One final present finished after she went to bed.